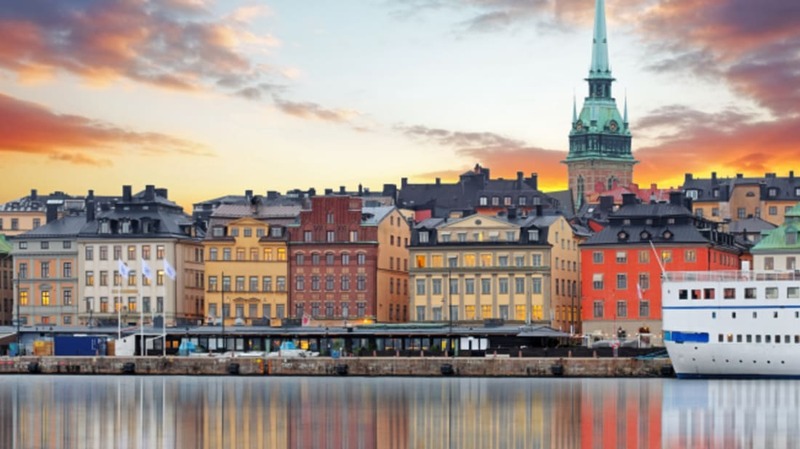 Stockholm’s 73 square miles stretch over islands and hills [PDF], encompassing modern Scandinavian designs and cobblestone streets that look straight out of a fairytale. Located where the Baltic Sea meets Lake Mälaren, Sweden's waterfront capital has as little as six hours of daylight in the winters and as much as 18 hours of sun in the summers. Read up on 25 other tidbits about the city nicknamed the Venice of the North. 1. The name Stockholm comes from the words stock meaning "log" and holm meaning "islet." No one seems to know exactly how the town got its tag; one account claims that Vikings trying to determine the location of their new settlement used a log bound with gold, while others point to the masses of logs driven into the waters near Old Town. 2. The first recorded use of the name "Stockholm" dates back to 1252 when it appeared in a letter written by Swedish statesman Birger Jarl. 3. Stockholm was built on 14 islands, connected by 57 bridges, earning the Swedish capital the nickname "Beauty on the Water." 4. Kungliga Operan—the Royal Swedish Opera—was founded by King Gustav III in 1773. Nineteen years later, he was shot at a masked ball at the venue and died. The building stood for another century, then was torn down in 1892. A new opera house was built in 1898 and inaugurated by King Oscar II. Today, the theater still stands in the same spot across the Norrbro bridge from the Royal Palace. 5. Stockholm’s Old Town, or Gamla Stan, remains one of the best preserved historic districts in Europe—partially due to the fact that its cobblestone streets are reserved for pedestrians only. 6. The narrowest street in Old Town is Mårten Trotzigs alley, which has 36 steps and is a mere 35 inches wide at its slimmest point. 7. The Baroque-era Royal Palace on the Old Town island has more than 600 rooms spread across seven floors and a daily Changing of the Guard at 12:15 p.m. (1:15 p.m. on Sundays). 8. In 1628, the great Vasa warship, which took three years to build, sunk in the Stockholm harbor after sailing barely 4200 feet. It took a whopping 333 years to salvage the remains. Today the iconic ship stands in its own equally striking 134,979-square-foot museum, which features 55 outer wall corners. 9. Sweden’s oldest amusement park, Grona Lund, dates back to 1883, when a garden inside Djurgårdsstaden was transformed into the fairgrounds. Among the 30 rides are the Lustiga Huset (Fun House), which opened in 1917, and the Blå Tåget (Ghost Train), which has been scaring thrillseekers since 1935. 10. Built in 1891, Stockholm’s Djurgården island is home to Skansen, the world’s first open-air museum. The 150 buildings are a journey through 500 years of Sweden’s history, including Skåne farmsteads and Sami camps. 11. The Nobel Prizes in physics, chemistry, medicine and literature have been awarded in Stockholm every year since 1901 on December 10, the anniversary of Alfred Nobel’s death. Why? The Swedish-born inventor requested so in his will. As for the Nobel Peace Prize? That honor is bestowed in another Scandinavian capital: Oslo. 13. When an architecture student discovered that 13 elm trees were scheduled to be chopped down in Stockholm’s Kungsträdgården for construction of a metro station, he got his hands on a copy of the plan—as well as three alternate plans which didn’t involve touching the trees—and spread the word. The day before they were supposed to be cut on May 13, 1971, almost 1000 Swedes gathered in protest, some even climbing the trees. Trees from the Battle of the Elms still stand today—although scars from a chain saw can still be seen on one. 14. The Nordic tradition of saunas is still alive at the 32,292-square-foot Centralbadet bath house in the heart of Stockholm. Designed by architect Wilhelm Klemming and opened in 1904, the spa’s main pool has hosted world-class competitions, including several with five-time Olympic medalist Arne Borg. 15. Craving some art? Head down into Stockholm’s metro stations. Dubbed the World’s Longest Art Gallery, more than 90 of the 100 stations along the 68 miles of track have been decorated with mosaics, paintings, sculptures, and carvings by artists since the 1950s. 16. Sweden’s national treasure, the global furniture chain IKEA, boasts a 594,167-square-foot location in Stockholm’s Kugens Kurva municipality. Opened in 1965, it remained the world’s largest for 49 years, until the 2014 construction of a 635,070-square-foot store in South Korea’s Gwangmyeong. 17. The term "Stockholm Syndrome" was coined by criminologist and psychiatrist Nils Bejerot after hostages from a six-day siege at Norrmalmstorg Square’s Kreditbanken bank in 1973 developed a liking for their captors. As one of the victims, Kristin Ehnmark, explained in 2009: "It's some kind of a context you get into when all your values, the morals you have, change in some way." 18. Sweden’s literacy rate is 99 percent, so it’s no surprise more than 4 million books are borrowed from Stockholm’s libraries annually. 19. What do Nelson Mandela, Beyoncé, and the Swedish national hockey team have in common? They’ve all taken center stage at the 16,000-seat Ericsson Globe, the world’s largest spherical building, which opened on February 19, 1989. 20. True Swedish Blood: Alexander Skarsgård was born in Stockholm on August 25, 1976 to actor dad Stellan Skarsgård, who has starred in 1990’s The Hunt for Red October, 1997’s Good Will Hunting, 2006’s Pirates of the Caribbean: Dead Man’s Chest, and 2008’s Mamma Mia. 21. Swedish commuters love their bikes: approximately 70,000 cyclists cross Stockholm’s city borders daily. 22. Tourism has been on the rise in Stockholm, with more than 26.5 million passengers arriving at Stockholm’s five area airports and more than 12 million overnight commercial hotel stays in 2014 [PDF]. 23. To encourage people to take the stairs, in 2009, Volkswagen turned a staircase in the Odenplan metro station into a Big-like giant piano keyboard, so that Swedes could literally dance over musical notes as they exited. They found 66 percent more people opted for the stairs over the the escalator next to it. 25. Mamma mia: Stockholm has an entire museum dedicated to ABBA. While visitors can get a glimpse at some of the 1970s band’s gold records, wardrobe pieces, and gadgets, the true goal of the museum is to let you “experience the feeling of being the fifth member of ABBA,” by trying on clothes, singing in the Polar studios, and even channeling your inner dancing queen by getting on stage with holograms of the band.